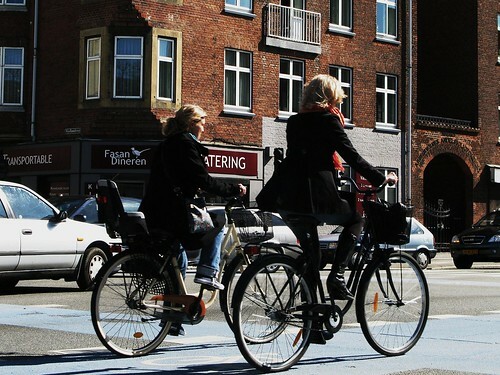 As ever, cycling in Copenhagen is a sociable affair. 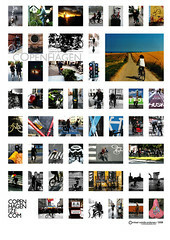 You go on dates on your bikes, to the cinema, a café, to work and home again. It's physical. You ride close to each other and can talk freely. You're both in motion, moving forward. Talking. Listening. Being together. Bike. Bus. Both start with B. Coincedence? Here's another poster available on our online boutique. 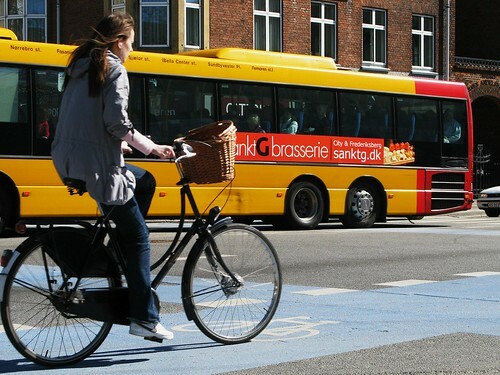 This one features images of Copenhagen's bike culture. Capturing a mood, a style, a way of life. This poster and the first one will be featured in an upcoming exhibition that will travel around the world. More on that as we get the detailed information. It's like motorcycling here in the US, although less noisy and disruptive. This is really cool! The social aspect of riding bikes together with friends, girlfriends, boyfriends ect...I havent thought about it since I was a kid. Our bikes meant everything to us, and I mean everything. We did everything and anything on our bikes just like you have shown here. You have brought back great memories to me just now of riding fast jumping ramps and flying through the air on my old Schwinn! I like the girl's on the bikes too! Its hot! thanks joearado. a lovely comment. imagine that childhood thrill lasting for a lifetime. such is copenhagen.